Something has changed drastically in our society since I was a stripling. I can remember when there weren't any personal computers at all. I can remember when telephones were hooked to the wall. I even pre-date cordless phones. Big Brother and Big Business are watching us as we use our computers. But there's a flip side to that. Equipped with phones that can record video, we are now watching Big Brother. I call this the IPhone Rebellion. If a police officer uses unusual or excessive force, someone might catch it on video and post it to the Internet. This has happened frequently over the past few months. We had a situation in Baltimore, Maryland in which a young man was killed during the initial stages of arrest by the police. Has this ever happened before? You betcha. Has it ever been recorded on a cell phone? Not in Baltimore. Who among us has not recoiled in horror at the video of that young person being dragged by police, his face twisted in agony? Speaking for Anne Johnson here, I was horrified. And I'm not young or African American. I cannot even imagine how African American citizens are dealing with this emotionally. There are riots in the streets of Baltimore. I am calling this the second incident in the IPhone Rebellion. Someone snaps a video, loads it onto the Internet, everyone sees it, and some people react. Then we get soldiers on city streets, with armored vehicles and guns. We also get alliances between urban gangs who have longstanding rivalries. What do you call this? I lived through the 1960s, and I do know that rebellions are squashed with impunity in this country. But we have the Internet now. What are they going to do? Shut it down? Welcome to "The Gods Are Bored," humble home of an average human being! 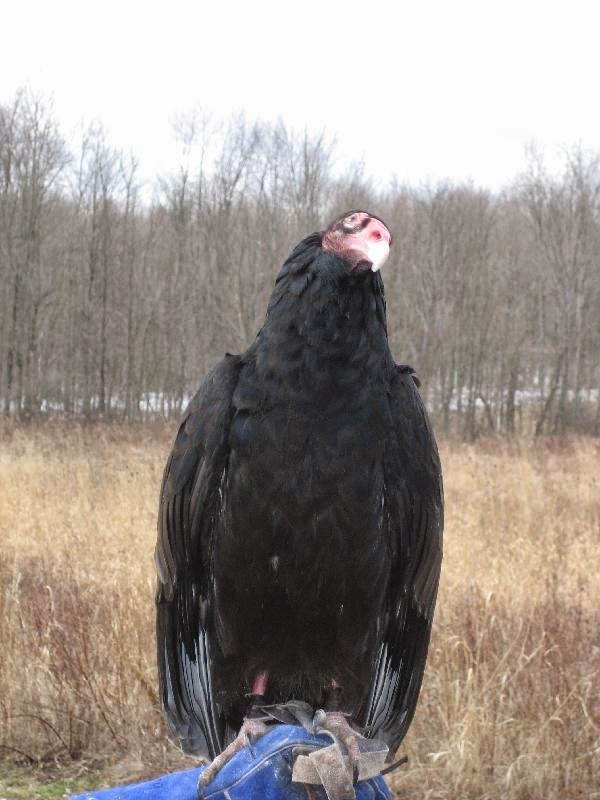 Nothing exceptional about me ... except for the way I go on about buzzards. 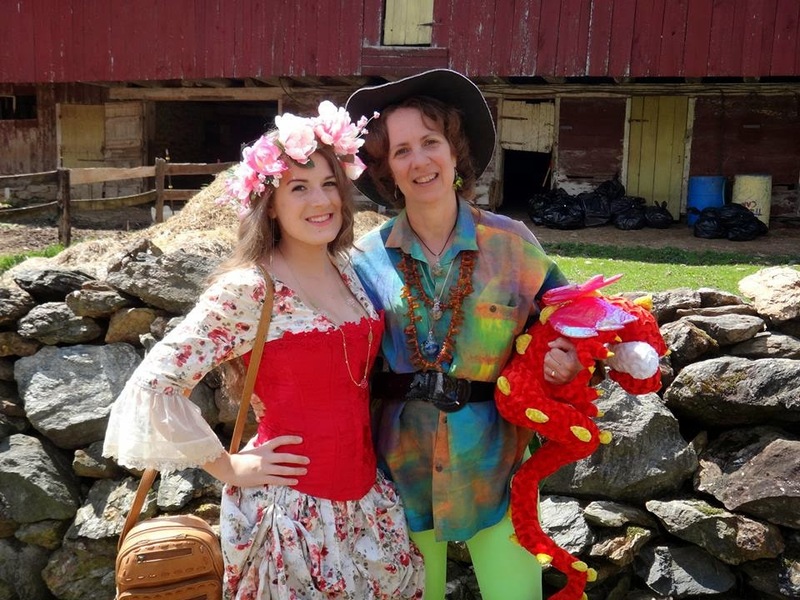 Every year at Beltane, my daughter The Spare and I sojourn to Glen Rock, PA, where we lead the Mountain Tribe at the May Day Fairie Festival at Spoutwood Farm. We've been going to this festival for almost a decade. 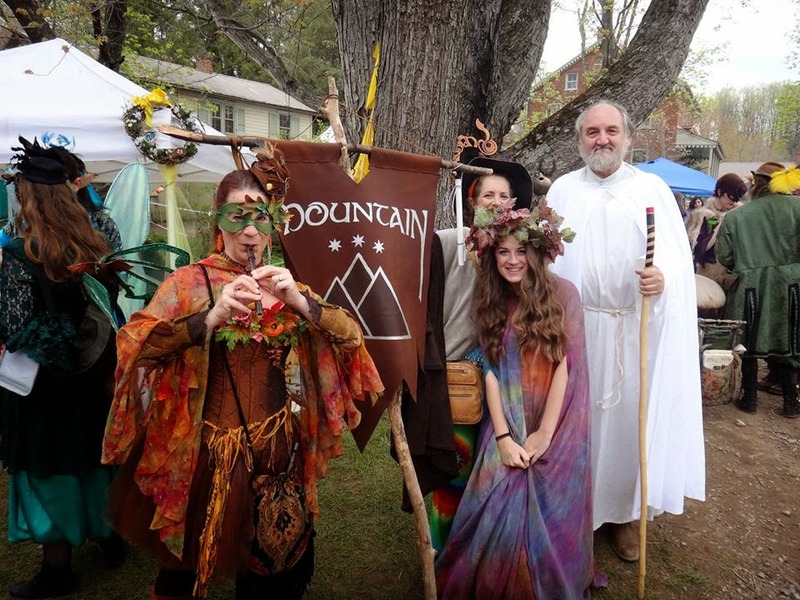 Spoutwood is a beautiful spot, and everyone dresses up like faeries or creatures or free spirits. There's wonderful music, and food vendors, and drum circles, and ceremonies. As Mountain Tribe leader, Spare takes part in a midday ceremony each day that varies little from year to year. We do a lot of shouting, then we march in, then we sing some songs. We have a beautiful leather banner made by one of the artists at the Faire. This is a picture from last year. The well-dressed fairy with the flute is my sister. Last year she came to the festival and stayed in our hotel room all three days. It was the first year I didn't have a good time. Or, I wouldn't say I didn't have a good time ... I just didn't have as much fun as usual. 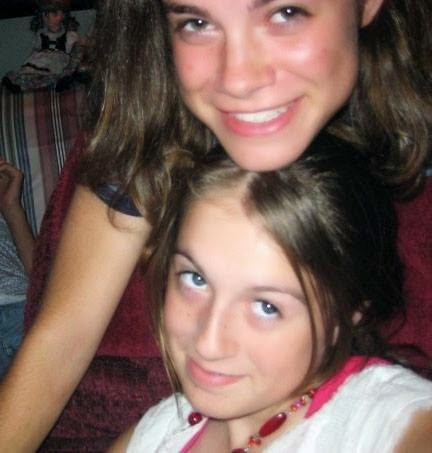 The reason for that was that I found myself in a childhood dynamic with Sis. I really resented having her at my side for three days. She didn't want to do anything by herself, and at these things I always crave an opportunity to be alone in a crowd. Growing up with a very ill mother, I often had to take care of my sister. So these days, even if I'm not really taking care of her, I am taking care of her in my mind. And it's a chore. Especially since, in her mind, I am supposed to take care of her. Well. That was last year. I didn't invite Sis this year. I shouldn't need to -- it's an open event. She can come and go, and I would even be glad to see her there if I didn't have to care for her! Just now I talked on the phone to Spare. She says she has a lot of school work to do and will need to curtail her hours at the festival. That's fine with me! I want to do some meditative drumming. I want to walk the land. I want to respectfully acknowledge the bored gods. Just me. Just me and a few thousand other people. Alone in a crowd. Welcome to "The Gods Are Bored," ten years of joyous romping in the Realms of the Mountain Gods! I'm Anne Johnson, and I used to get far more riled up about politics than I do now. Pretty much I have given up on the system. I have lived long enough to see how things are now, as opposed to how they were in the mid-20th century, when we actually ousted crooks instead of deifying them. This is why, although it would be very nice to have a woman running the show in the US of A, I can't get behind Hillary Clinton. If the fix is in, she is one of the authors of it. I remember when Bill Clinton was president. Hillary was way more than a "First Lady." No tea parties and back yard gardens for her! She set her sights on a Universal Health Care bill and lobbied tirelessly for it. She was unsuccessful. Bill Clinton signed NAFTA into law. Jobs moved overseas in cartloads. Then he presided over the repeal of the Glass Steagall Act, which set up our too-big-to-fail banks and laid the path for the ruthless hedge funding that is now the way of the world. I don't call that a stellar liberal political record, right there. To say the Clintons, when they were running America, did a better job than George W. Bush, is damning them with faint praise. I supported Obama because he was a fresh face, and he exploited that fact. Say what you want about him -- and say what you want about Obamacare, because it's sure not perfect -- he did get health care done. Mrs. Clinton had my tepid support until it was revealed that she used her personal email to conduct the business of state. This should not be done. How do you justify that? If you say it was for convenience, you're lazy. If you say it was to avoid scrutiny, you're a Clinton. This country should not be run by two or three powerful families. That's how dictatorships are born. We at "The Gods Are Bored" can hardly believe that we would support a pudgy old white man over a woman, but Bernie Sanders it is. Doesn't matter anyway, because the fix is in. This is a nation run by a few very wealthy families, and they want us to eat cake. Ten Years of "The Gods Are Bored!" Wow. It's our tenth anniversary here at The Gods Are Bored! There are over 2200 posts. And a half million page views. Dozens of bored deities have sat for interviews. Goats were judged back in the day. Not so much anymore. 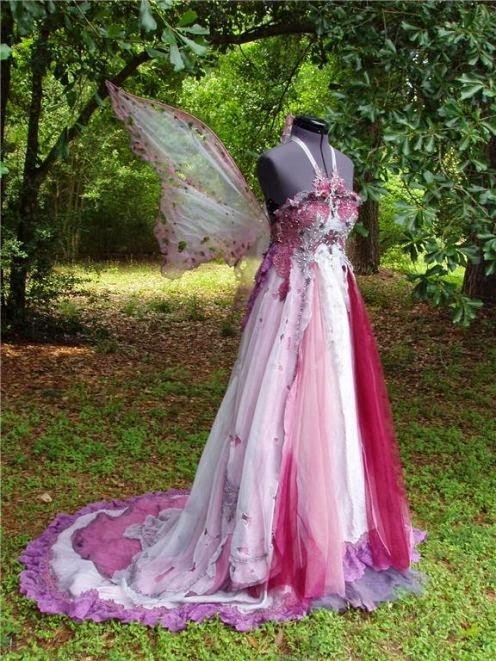 We will always love faeries! Remember Puck? 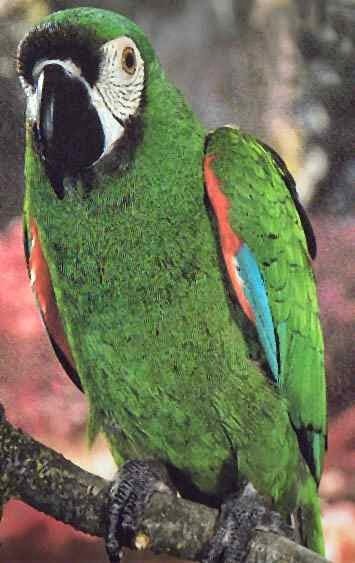 So many adventures with Decibel the parrot! I couldn't afford to buy the family farm, so I've asked Gaia to reclaim it. This view is already lost due to tree growth! 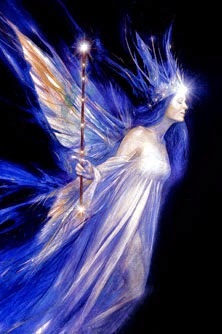 I love the Goddess Brighid the Bright. She led me to the Light. One day when they're older, my daughters The Heir and The Spare will come here to read about their lives! Spare was 11 when I started this blog. Tomorrow she turns 21. Oh my. There's been one magnificent, overriding passion here at "The Gods Are Bored," celebrated with supreme devotion since this site's inception. That passion is the Rich Worship of the Great Sacred Thunderbird! Long may Vulture own the skies! Thank you, readers, for your comments and support lo, these many years. It doesn't seem like a decade has passed since that day I read an article about a woman who got money to pay her dog's vet bills by blogging. I didn't set out to make money here ... but your generosity through several projects has been heart-warming and well-remembered. Ten more years? Probably. There are still quite a few bored Gods and Goddesses out there who want their Voices to be heard! When He Says He's a Shaman, Believe It! Welcome to "The Gods Are Bored," a house of hilarity for nearly, almost, shortly, getting there -- ten years! I'm Anne Johnson, that's really my name, and here's a wild and wonderful "Gods Are Bored" story, fresh off just happening. I couldn't sleep last night, so I got up at 4:30 a.m. to go see King Neptune in His briny deep. From where I live, at 4:30 in the morning, you can cruise on down to the edge of the continent in about an hour. 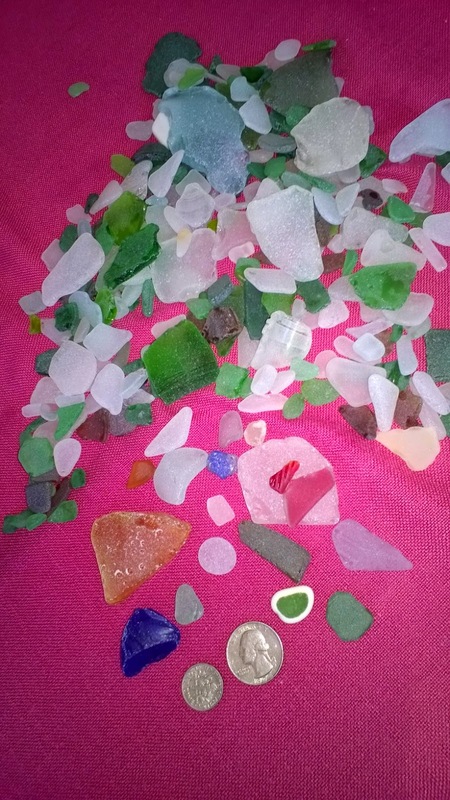 It was my intention to be on the beach, searching for beach glass, at "can see," which right now is about 5:50 a.m. When I got to the sea glass beach, it was barely, barely light enough to see. All the casinos were still lit up (and empty, for all I know). When I pulled into a dead end street to park, there was a big rig cab with a dude inside. He was just staring out at the water. This made me a little nervous, but I've always had a lot of luck being alone places with strange dudes. This time was no exception. I got on the beach, paid respect to King Neptune and Queen Oshun, and I tucked into hauling in some sea glass. It pays to be the first one there, because it's pretty much a candy shop after an overnight high tide. I'd never gotten so much glass so quickly. And after a few minutes, I saw the trucker dude, standing on the beach. When I got a little closer to him, we struck up a conversation. He'd never been to Atlantic City before and was interested in its history. He knew a lot already and was a big fan of "Boardwalk Empire." When daylight truly emerged and I got closer to where he was standing, I found that he was chock-a-block with Pagan bling: pentagram and Celtic knot rings, Green Man on a cord around his neck. I said, "Whoa, you are my kinda guy." And then it was like we were long lost pals. He was from Kentucky. He had never heard of sea glass before. He said he was a Shaman, and that his wife was into minerals and Tarot cards. I didn't press him about what kind of Shaman he was. I figure ... and I know I'm in the minority here ... if you go to the trouble to call yourself a Shaman, well then, by golly you are one. 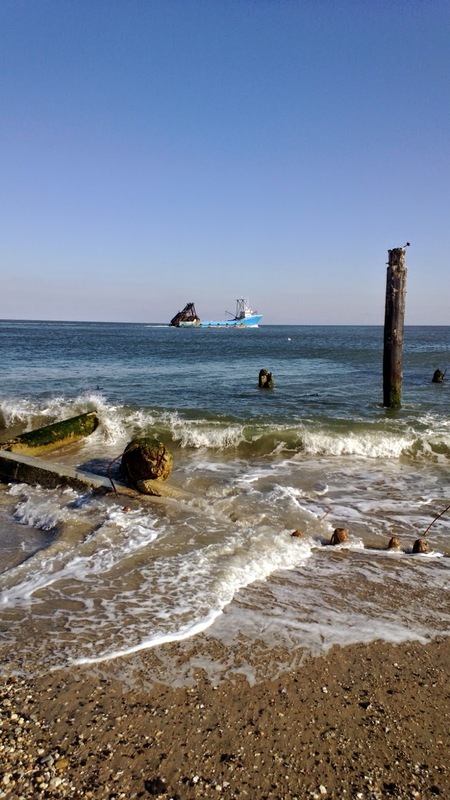 We were chatting about the bootleggers who off-loaded their cargo in the area of Atlantic City where we were. 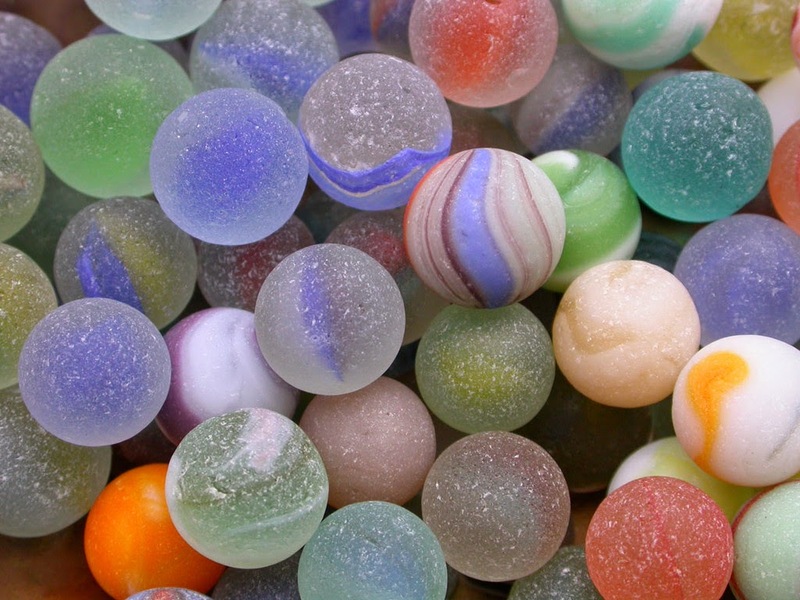 I said, "Yeah, they used marbles as ballast in their ships, and finding them all washed by the sea is a real treat. They're very rare." He looked down at his feet and said, "Here's one." And handed me a marble. I've been going to AC for four years now, and I have found two marbles. Well, I found three, but King Neptune wanted to keep the third. It had been a long, long time since I found a marble, and I never, ever found one on that stretch of beach before! And this Shaman had never heard of sea glass, and the moment he heard of it, he found a rare piece! Readers, the Shaman and I had the beach to ourselves for about 20 minutes. That's all. By 6:30, full daylight, hordes with rakes descended and started beach-combing like fiends. You snooze, you lose. The Shaman asked me for suggestions as to where he should spend the rest of his day. He certainly wasn't keen on casinos, but he wanted to walk the boards in an "artsy" place, maybe with a few ink parlors. I directed him to Asbury Park. We said our "Merry meets" and parted paths. I went to another section of beach and combed some more, very profitably, but (predictably) no marbles. When I returned to the main sea glass beach, the truck was gone. I hope the Shaman found his way to Asbury Park. 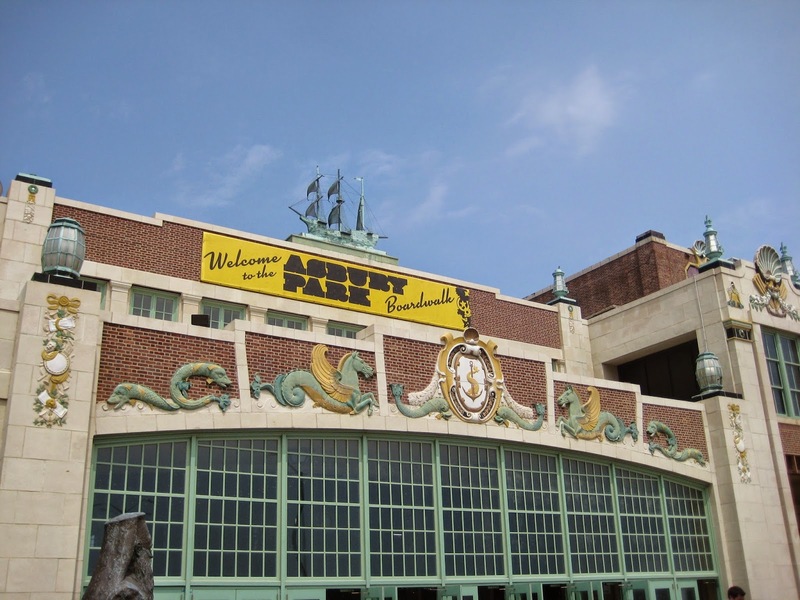 For my money (and it ain't cheap), Asbury Park is the best boardwalk in New Jersey. Anything beats Atlantic City. So, who establishes the criteria for "Shaman?" I know you can read a load of books and study up on ancient Celtic lore, and all that. But at the end of the day, the title is nebulous. To my way of thinking, though, the performance of minor miracles most definitely gets you the Shaman badge. For a guy who had never been to AC before, had never even seen sea glass before, to just reach down and find a marble, well. I'll sign off on him. Okay, okay, do you want to see? This was my best day ever ... even better than the day I found my own marbles! I found two pieces of red (one is magenta! ), a huge chunk of yellow, lavender, a nugget of cobalt, and lots of really pretty, well-rounded nuggets. And someone, I think a Shaman, gave me a marble! Welcome to "The Gods Are Bored," where we didn't find out what those colored eggs and bunnies were about until we were in mid-life! Yes, it's another stolen holy day! But I'm wise to it now. Don't you just love Thalia Took's work? This one is particularly beautiful. Today my daughter The Heir and I got up at dawn, and instead of going to church we went to the beach. We spent five hours hunting sea glass and soaking in the sun. As we stood there staring into King Triton's briny deep, I said to her, "You are so lucky to be all done with church at such a young age. Just think of all the beautiful spring Sundays we spent holed up in a gloomy sanctuary, over-done with dead flowers! And you have your whole life ahead to spend this particular Sunday in some refreshing and bored-god-approved activity." She said, "Mom, so do you." The rocks, the mountains, the beach, the woods -- these are my Temples. Dancing, and drumming, and meditating, and hiking, and laughing -- these are my devotions to the Gods. It's Spring! 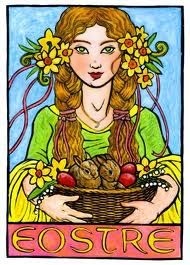 Time to be out, to be alive, to shake off the cold and to welcome dear Persephone back into the land of the living. All that falls shall rise again. All. Hello and welcome to "The Gods Are Bored," pouring tea and baking scones for bored deities from multiple pantheons for almost ten years! Yes, we've got a big anniversary coming up next week! 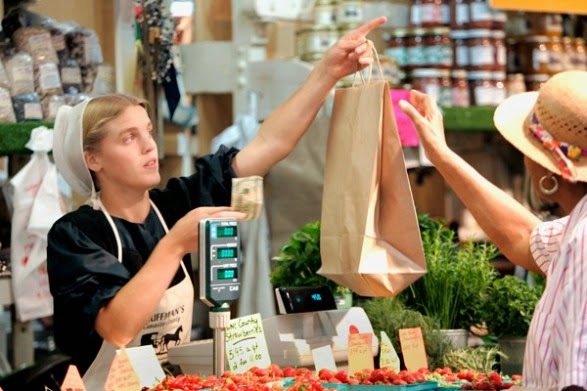 There's a very famous market in Philadelphia called Reading Terminal Market. It's a big place, and on the weekends it is stuffed to the gills with locals and tourists. You can get a Philly cheese steak sandwich there, or fried oysters, or the best, freshly made donuts in the city. There are a dozen different ethnic foods, both for raw purchase and already cooked. I'm a total sucker for the crawfish etouffe at the Cajun stall. Some of the booths in Reading Terminal Market are staffed by the Amish. The market is open on Sunday, but the Amish booths are closed. On Sundays they are at home, being Christians. With all this anti-gay bigotry on display in our nation's heartland, I have been thinking about the Amish in Reading Terminal Market. They sell stuff. Lots of stuff. Mostly food, both fresh and preserved. So, who shops at Reading Terminal? People. All kinds of people. City people, artsy people, tourist people, gay people, straight people, Goth people, Pagan people, atheist people, drunk people, high people, Jewish people, teenagers, senior citizens, Asians, African Americans, and foreigners of all stripes. I have never seen an Amish vendor turn away a customer, for any reason. Why is this? Aren't the Amish really, really super religious? Indeed they are! They think we are all going to Hell. Every last one of us who isn't Amish. We are all sinners in their eyes, and all doomed. Then why do they serve us? They serve us because it isn't their business to care about our souls. It's their business to care about their large families and keeping food on their own tables. Selling to sinners, you see, isn't a sin. If these extremely strict Christians can sell donuts to drag queens, why should it be an issue anywhere? It's an issue because many people are just hateful. They don't want anyone to be happy. Boils down to that, folks. You don't see much hate coming from the Amish. A few years ago, a crazy gunman took hold of one of their school houses and shot a bunch of girl students, even some very young ones. There was no call of vengeance from their community. In fact they comforted the killer's wife. And they steadfastly refused to speak to the press. In my opinion, the Amish set the gold standard for what Christians should be and do. They keep their views to themselves, they live and let live, and they do not discriminate in matters of commerce. Whatever their expectations for behavior may be, they confine those expectations to their own communities and leave the rest of us alone. You know what else I love about the Amish? You never get them at your door on Saturday morning, trying to persuade you to become Amish. Live and let live. Some people -- I'm not saying who -- could sure take a lesson from these folks. Well! Let me tell you, my friends ... being a supporter of the bored gods pays off big time! Today my principal came into my classroom during home room. He said, "Mrs. Johnson, your services to this school have been unappreciated for too long. Effective immediately, we are doubling your salary!" My students stood and applauded. That's right, I got a standing ovation. One of the "mean girls" who sits right in front whispered, "It's about time, too!" I think I'll look smashing in this. Then I thought, "Whoa! I'm no longer leader of the Mountain Tribe! 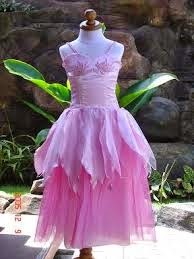 Spare will need a new fairy gown too!" So I bought her one. After home room, the principal gave me the rest of the day off. So Mr. J and I drove down to Atlantic City. The conditions were perfect for collecting sea glass. Look what I found! In my whole time communing with King Triton, I had only ever found three marbles before! Today I found four dozen! Aren't they stunning? When I got home, I got a call from the animal shelter. They needed someone right away to foster a kitten. 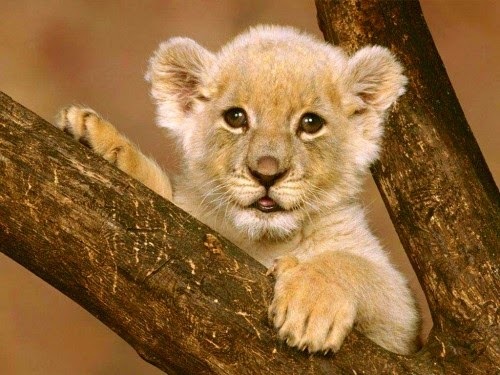 I'm going to name her Kimba. The Gods are good to me! I hope you all have the kind of day I had -- whew! I'm going to sleep well tonight!